Karen Beacham, clarinetist, is band director and teacher of music theory and instrumental music at Maine School Administrative District No. 9. She serves as Principal Clarinet with Maine Chamber Ensemble, Maine State Ballet Orchestra, Atlantic Chamber Orchestra, and Portland Ballet Orchestra. Ms. Beacham also performs with the Portland Symphony Orchestra and is a founding member of the Nordica Trio. 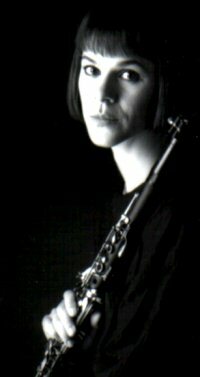 For the 2005–2006 academic year, she returned to serve as Applied Music Associate in Clarinet at Colby College, a position she held during 1993–2000. Ms. Beacham has held the position of Principal Clarinet with the Mexico City Philharmonic, Orquesta Sinfónica de Minería in Mexico City, and the Tulsa Philharmonic. She has performed as soloist with Mel Tormé and the Tulsa Philharmonic Pops. She has also appeared as soloist with the Maine Chamber Ensemble, Colby Symphony Orchestra and University of Maine at Farmington Community Orchestra. Recorded performances have been broadcast over a number of public radio stations in the United States and via television in Mexico. From 1999 to 2005, Ms. Beacham conducted the University of Maine at Farmington Band, building that ensemble from a dozen members to approximately sixty musicians. She holds a master's degree from New England Conservatory of Music as a student of Harold Wright, and a bachelor's degree from the Philadelphia College of the Performing Arts, where she was a winner of the Helen P. Neuman Solo Competition. Her conducting studies have been with Kenneth Kiesler at the Conductor's Retreat at Medomak and Dr. Peter Martin at the University of Southern Maine. Additional teachers include Anthony Ciccarelli, Peter Hadcock, Donald Montanaro, George Silfies, and William Wrzesien. Ms. Beacham has participated in many festivals, including the Kneisel Hall Chamber Music Festival, Sebago–Long Lake Region Chamber Music Festival, Aspen Music Festival, Sunriver Music Festival, New College Music Festival, and Norfolk Chamber Music Festival/Yale School of Music. In addition, she has performed as a guest artist with the Portland String Quartet.